This memoir takes the reader through the process of coming out. It is told in a funny, relatable voice (as a married, straight woman, I know relatable isn't the first word that may come to mind about another young woman's sexual preference discovery but oddly enough, it was). 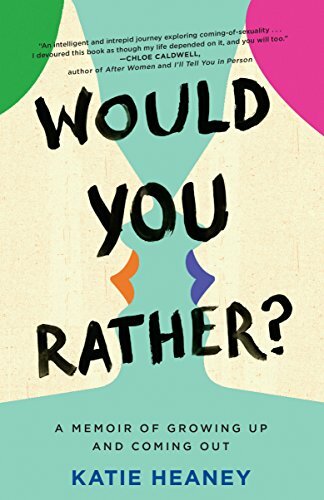 Katie is funny and witty, weaving her journey together through stories from college and young adulthood which coalesce into this kind of "ah-ha" scenario where everything just sort of clicks and makes sense. I saw a lot of myself in Katie, the OCD bed making tendencies (because really, what kind of heathen gets into an unmade bed at the end of the day?! ), her boyband infatuations (just trade One Direction for O-Town at that was me circa 2000), and her preference to sit at home and order take out versus people. While our stories are obviously not the same (whose really is when it comes down to it), it was something that I could connect with, and I think many people can connect with, regardless of the particulars of your journey into adulthood. A truly engaging memoir, Katie has a new fan. I would gladly read anything written in that lighthearted and thoughtful voice.